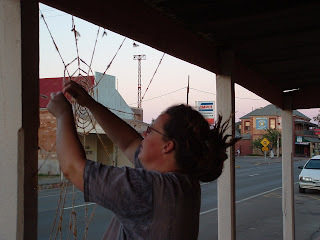 There's a man who makes spider webs as an art and way of life. I really liked that concept when I heard it. 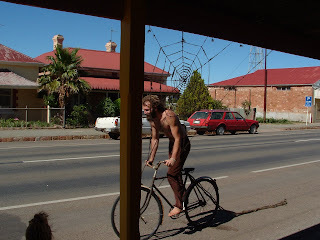 And I either saw him, or someone else who really liked that idea at the Rainbow Serpent Festival in Victoria, making an awesomely huge spider web. I thought I'd give it a try. I also make many allusions to spiders as being my sister spinners and other such yarns, and have talked about making spider webs for years. 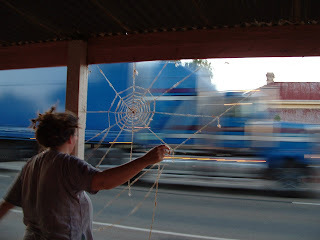 When we moved out to the Far North, I told people they could come to town and look for the shop with spider webs on the verandah. So I thought I'd better make good my promise. I only use single ply usually, so I had to make some two ply - then I remembered Navajo plying which is ostensibly 3 ply and got into some of that. It started off innocently enough. Just one up with bells on all the ends, so it lightly tinkled in the breeze. What I wasn't prepared for was the reaction from the town folk! You see, where we live, is full of people who search hard for entertainment. One of the local rituals is the 'mainy', which is the process of driving up and down the main street all day. I must have been mainy candy, cause a lot of cars went past a lot of times, while I was doing it and afterwards. The town was abuzz! and the postmistress had to drive her girls past the spider web three times in one afternoon. I grew to really love that spiderweb. Who they hell are 'they' for a start, and maybe if people didn't focus on it so hard, things like that wouldn't happen!! So 'they' did, whoever they were, and I was really bummed. I tried to think of ways I could make spider webs on frames that I could take in and out, so I could protect them. I thought I wouldn't bother at all. But then we did a market here one day, and all these people who I didn't know, knew about us, and they all mentioned the spider webs!! Been in just about every minority group a white woman can be in, and discovered that it's all good. There is no ultimate utopian society or group of people 'out there', and no-one's gonna tell me who I am. I am the person I've been waiting for. We all create our own realities, and I've made myself a doozy. I'm eternally in search of unfiltered, honest, bright and colourful life. The discovery of tactile fibre arts has brought me more into my feelings and body, and created more of an awareness of my connection to all that is. My planet, family and art is paramount. I'm also very proud to be a Fries, as is my lover and our children.